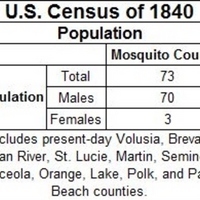 The Sixth United States Census population records for Mosquito County (including present-day Volusia, Brevard, Indian River, St. Lucie, Martin, Seminole, Osceola, Orange, Lake, Polk, and Palm Beach counties) for 1840. The Census Act of 1840 was signed into law on March 3, 1839 and later amended on February 26, 1840. This piece of legislation established a centralized census office during each enumeration. Congress designated the census questionnaire designs to the Secretary of State. However, each household received inquiries regarding "the pursuits, industry, education, and resources of the country" and included questions related to school attendance, literacy, and vocation. Original census data by the U.S. Census Office, 1840. Digital reproduction of original census data by the U.S. Census Office, 1840. Originally collected by the U.S. Census Office and published by the U.S. Department of the Interior. "1840 Overview." U.S. Census Bureau. https://www.census.gov/history/www/through_the_decades/overview/1840.html. United States, and Carroll D. Wright. The History and Growth of the United States Census. https://www.census.gov/history/pdf/wright-hunt.pdf. *Includes present-day Volusia, Brevard, Indian River, St. Lucie, Martin, Seminole, Osceola, Orange, Lake, Polk, and Palm Beach counties. U.S. Census Office. “U.S. Census for Central Florida, 1840.” RICHES of Central Florida accessed April 22, 2019, https://richesmi.cah.ucf.edu/omeka/items/show/3830.